Abby the Librarian: Another Year of Reading Wildly! This afternoon, we had our first Reading Wildly meeting of 2015 and I'm really excited to start another year of this reader's advisory training with my staff! We added a TON of new booktalking programs to our schedule this fall, so our genre concentrations have been a little spotty as of late. I'm excited to get back to exploring different genres and I'm really encouraging my staff to use our Reading Wildly meetings to get prepared for their booktalking programs. I have a couple of resolutions for this program this year. I really want to have some kind of article to discuss each month. I think having everyone read the same thing has been helpful to starting off our discussions and helping us have deeper discussions about whatever genre/topic we're discussing. To that end, I have spent the past couple of weeks researching and saving articles for us to use throughout the year. I fell out of doing articles in the fall because we got so busy and I'd forget until the day I needed it and then not bother with it. By picking out articles ahead of time, I know I'll have them. And if something else comes along in the meantime, I can always switch them out. My other goal is to really get back to blogging about our discussions and our progress each month. I have enjoyed sharing our journey with you all, although I've been too busy to keep up with it for the past few months. * I like to do Reader's Choice following and during busy months for us! Some of these genres are repeats and some are new for us. January was a Reader's Choice month for us since I know everyone is busy over the holidays (and one of my employees got married this December! Squee!). We started off by discussing our "article" for the month. We read the beginning of Chapter 7 of From Cover to Cover by Kathleen Horning. This selection gives an overview of children's fiction genres and a little history of children's publishing. I thought it'd be good to start off with a little refresher of what different genres are. We talked about the difference between formula series and more literary series books and the appeals of both. We also thought it was interesting that the push for "boy books" has gone on for nearly 100 years due to fears that female librarians would not be able to select books that are interesting for boys. We talked about the difference between high fantasy (fantasy set in completely made-up worlds) and low fantasy (fantasy set in the real world). For next month, we'll be reading and sharing transitional chapter books - chapter books aimed at 2nd/3rd graders. The "article" that we'll be starting with is A Missing Link in Closing Reading Achievement Gaps: Short Chapter Book Series with Primary Characters of Color by Sandy Carrillo & Jane Fleming. This is a Powerpoint presentation that was given at the NAEYC Annual Conference in 2011. 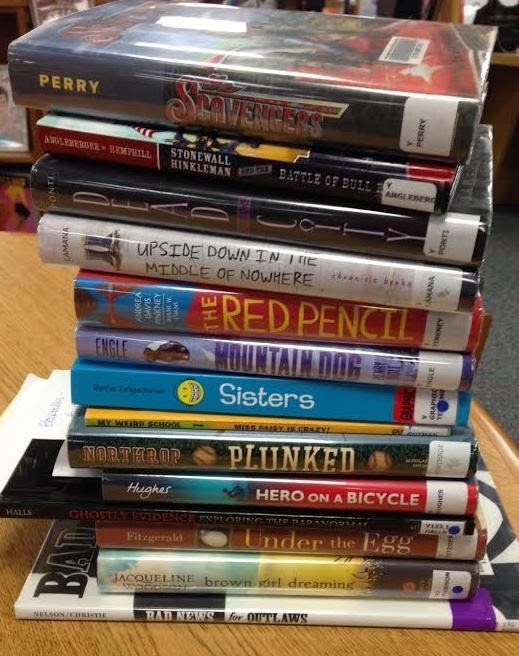 We definitely try to include diverse books in our booktalks and reader's advisory, so this presentation provides some great ideas of series to check out. What do you do to prepare yourself and/or your staff for reader's advisory?